This is the basic farm tour that we have successfully presented to many schools for over 25 years! Tractor drawn hayrides tour the fields around our working farm and along the way there’s a series of educational talks about our crops and how they are grown. 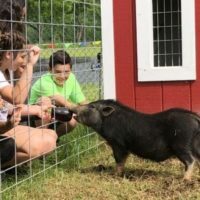 Friendly farm animals are popular with students, and offer a special learning experience for all. Meet the bees and our old tree. Tours last about one hour. Visitors will plant seeds to take home and receive a farm magnet and coloring book. The Traditional Tour is the foundation of all our Spring tours. Choose your tour and add an educational package below to extend the length of your trip! Your students will love this exciting package! 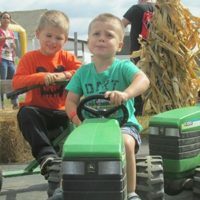 After they have enjoyed their Traditional Tour, students will have a blast riding John Deere tricycles (or mini pedal karts) through our pedal course … and will really enjoy trying to find their way out of our straw maze! 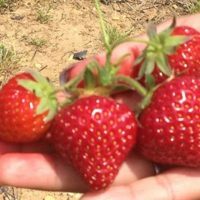 After taking part in our Traditional Tour, students will marvel at the opportunity to pick their own strawberries from our very own Jersey Fresh strawberry fields! Pretend you are a farmer — we give you the container, you pick the berries to fill it! This tour is only available late May through mid June. Combine tour packages into one and the fun and excitement will never end! With this package, students will take part in all our farm activities — our Traditional Tour, Activities Tour and Strawberry Tour. This tour is only available only late May through mid June.